I took all of my shoes out of the boxes and lined them up in a row. I realized that I had a ton of shoes that I no longer wore, outgrew my style or that I just simply didn’t like anymore. I then went to Target and picked up two of these expandable and stackable shoe racks. Expanded, the two racks together hold about 42 pairs of shoes. For reference, I wear a size 7.5/8 and my shoes fit fine on the racks. After taking all of the unwanted pairs out to giveaway, these are what I was left with. There are a few pairs here that will soon be replaced. This is a big step up from this. 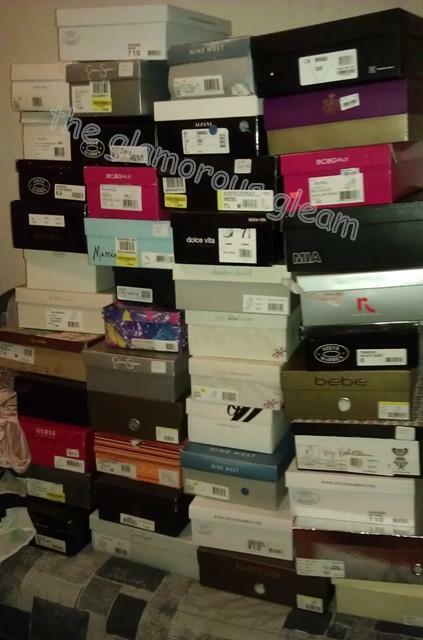 My original shoe boxes. I’ve been too chicken to get rid of them completely yet lol. 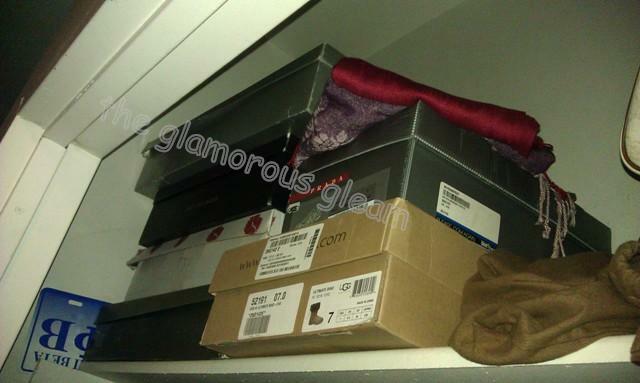 My tall boots are too tall for the rack so they reside in their original boxes on top of my closet with some Uggs and an old pair of kicks. awww I see some gorgeous shoes there! Lol I figured a lot of ppl had my same problem with the show organization. er uh, I didn’t answer how I store my shoes. I have a hanging shoe bag that got damaged b/c of the wt. of the shoes. Some are in the box, some are on the floor. some under the bed. Really need to get organized! 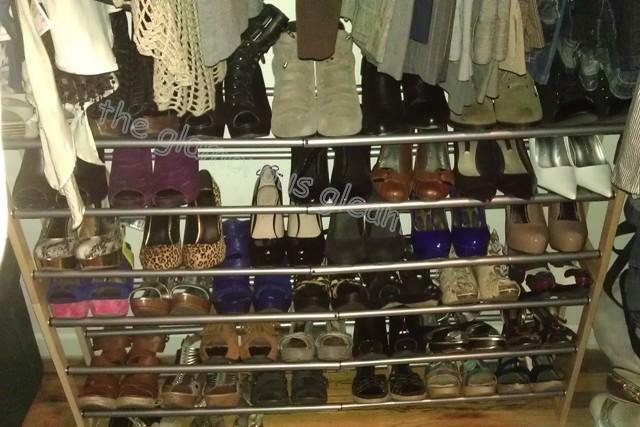 I have a similar shoe rack in black! I love it!! Also I have a problem with keeping the nice and sturdy boxes like Aldo and a few others! Thank you. So far it has really helped me to wear more of my shoes. It also helps me to see which shoes need repairs. Awesome! Thanks for posting this! 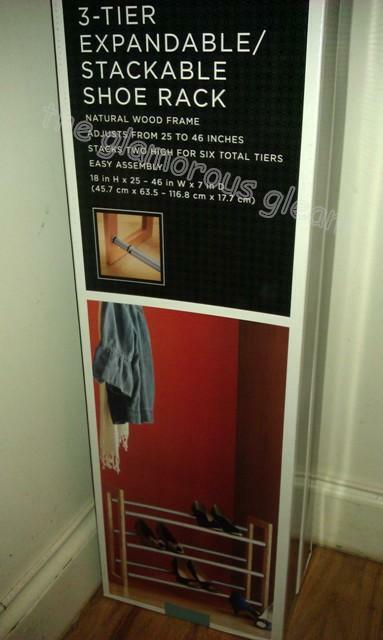 I just moved and have to do something with my shoes and I think I’ll go get one of those expandable racks. Awesome and no problem, glad I could help! Nice! I keep my in dust bags, some in boxes with photos and some shoved under the bed! Your before picture looks like a shoe shop LOL. And now you get to look at your gorgeous shoes – it was a shame to hide them away and forget about them! I love expandable and stackable shoe racks. What else could anyone need! That’s what I’ve got, although I do have a hanging organizer tucked away in the corner for flip flops etc.